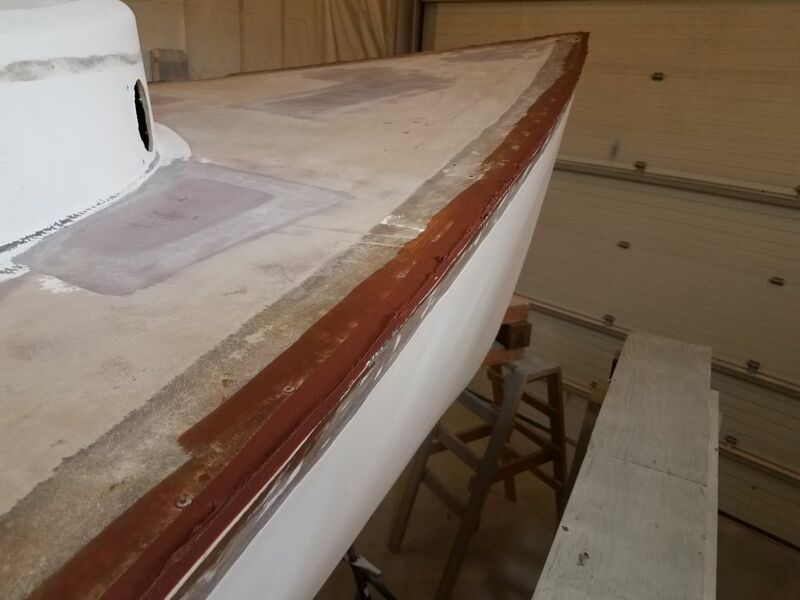 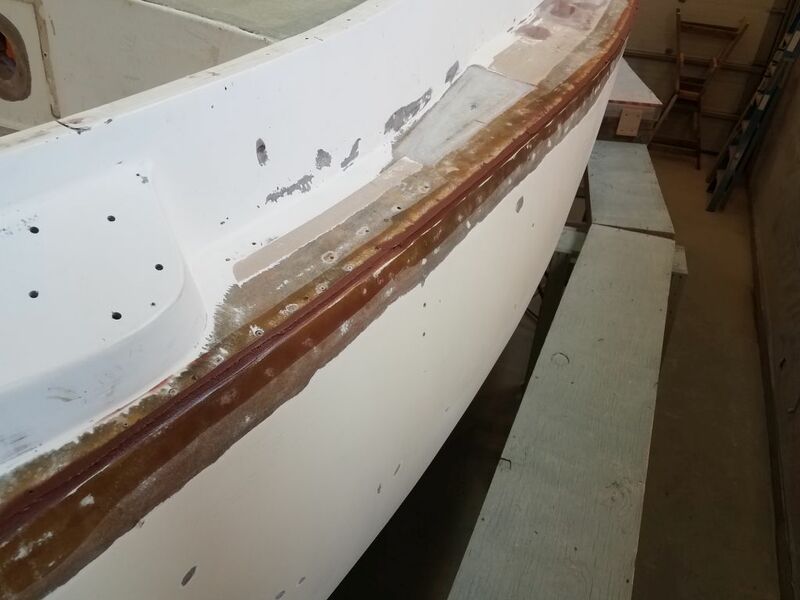 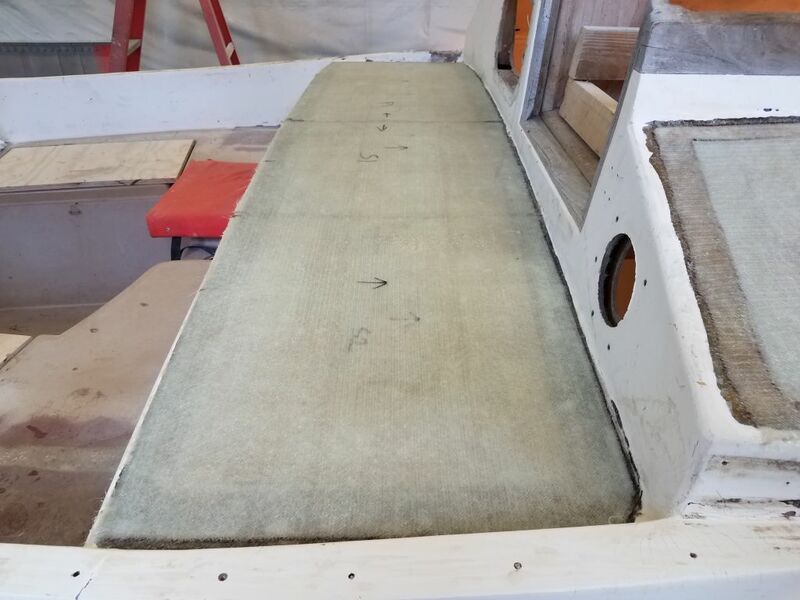 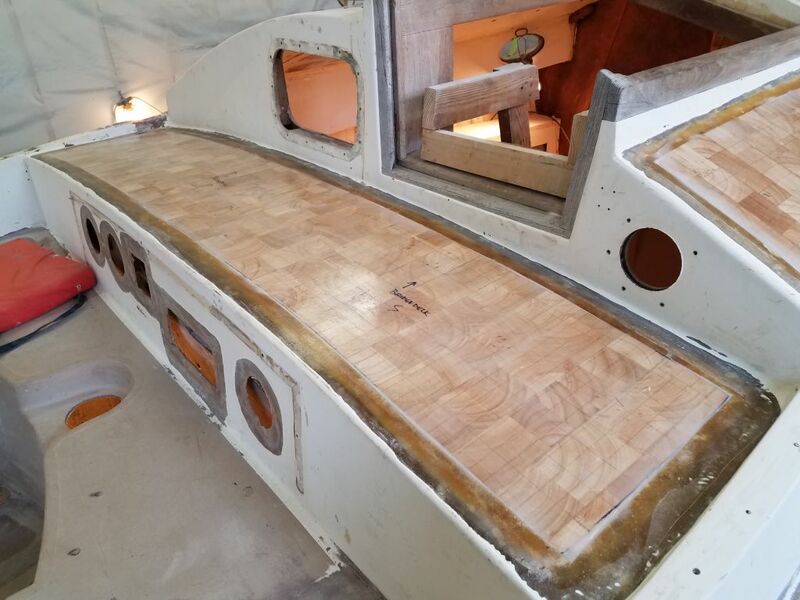 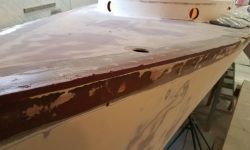 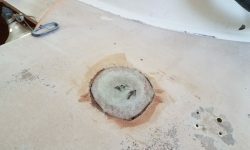 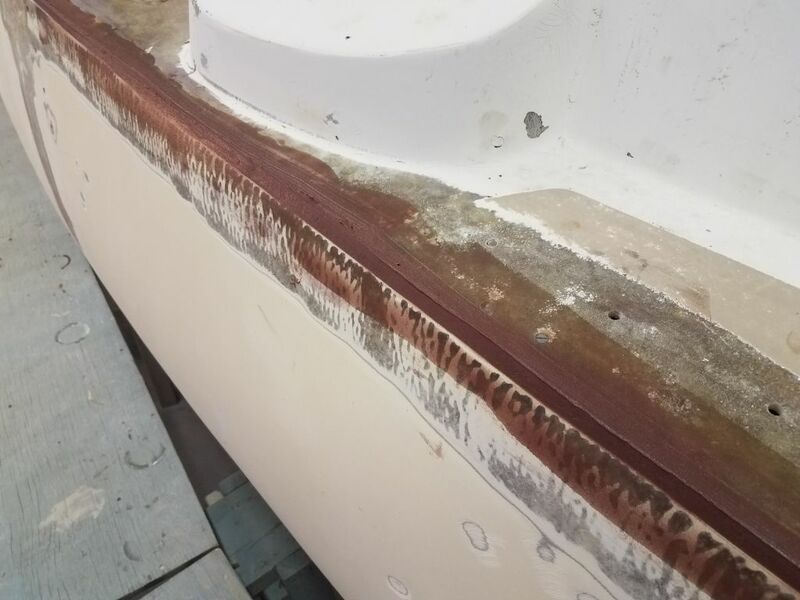 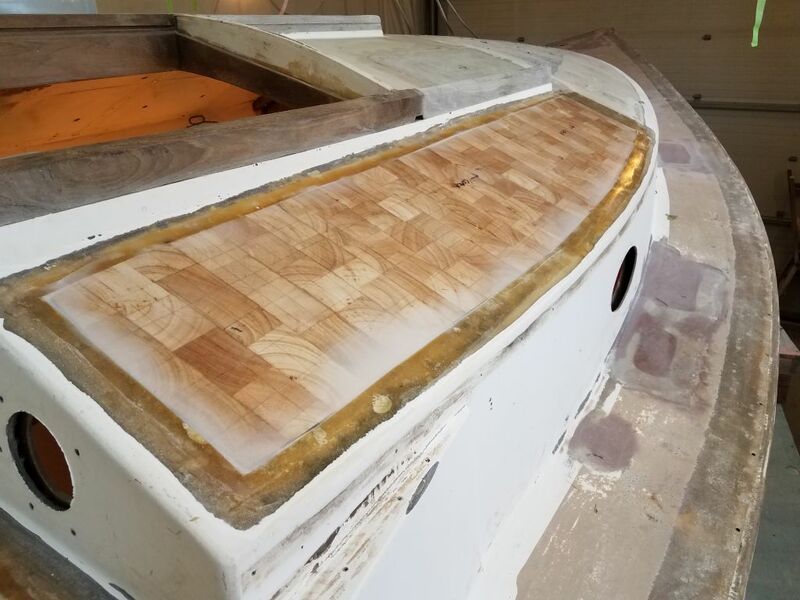 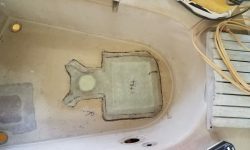 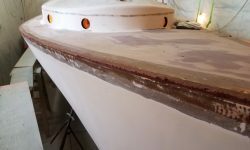 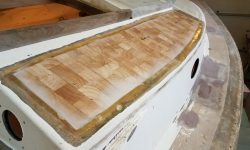 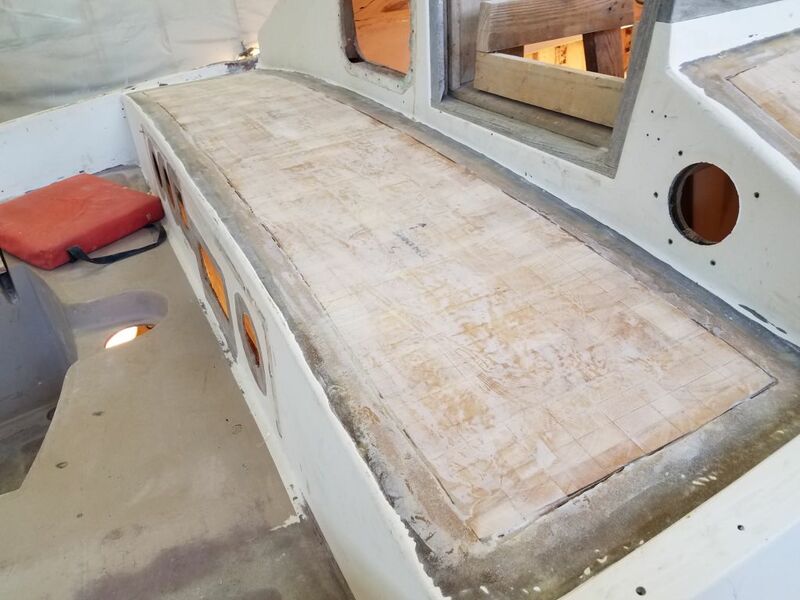 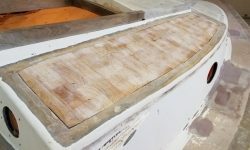 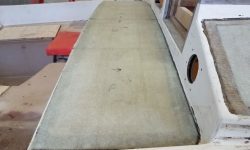 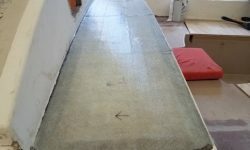 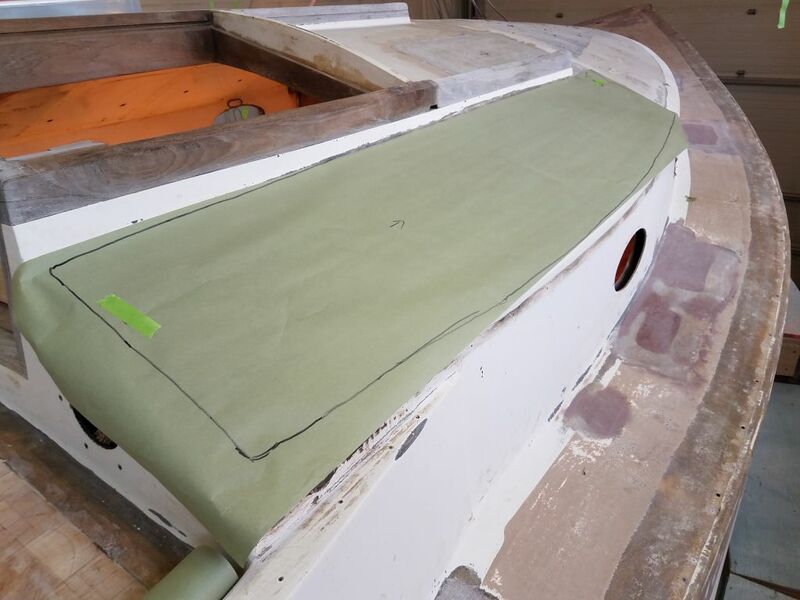 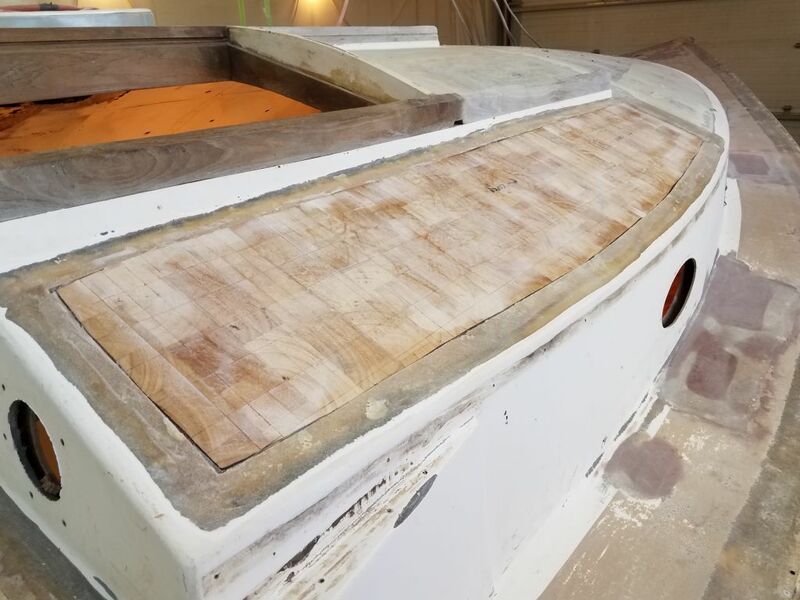 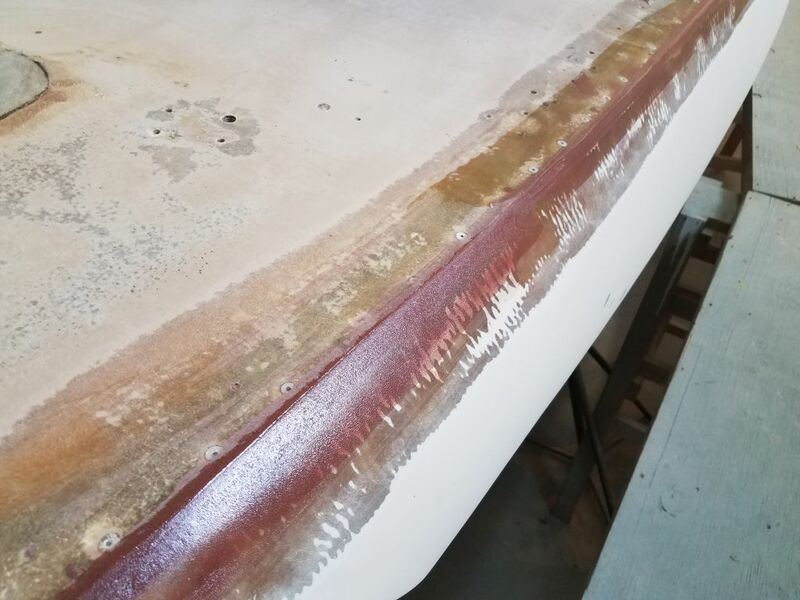 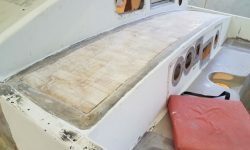 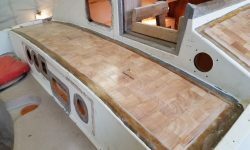 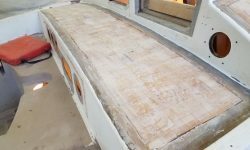 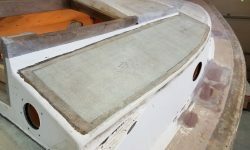 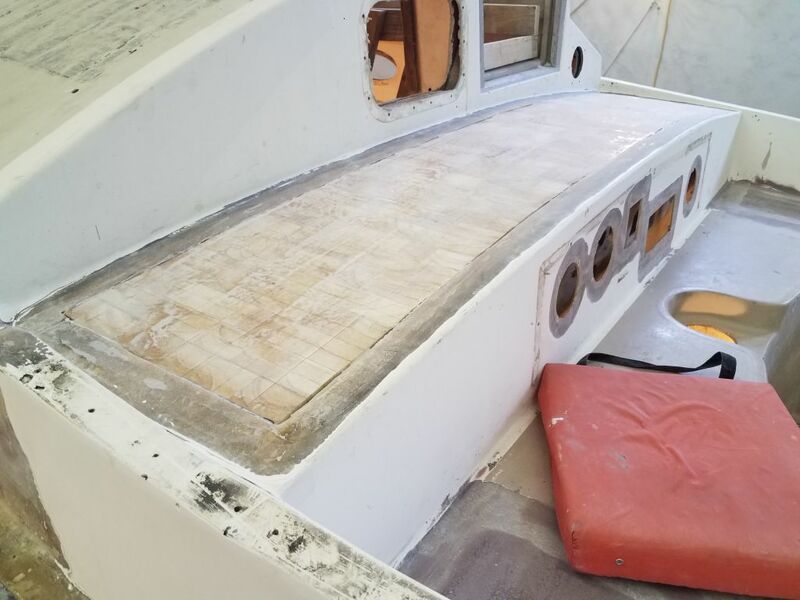 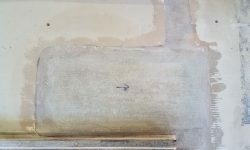 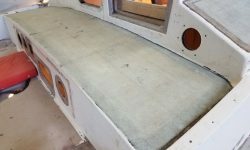 After removing the core weights and other preparations, I lightly sanded the newly-cored areas to remove any epoxy ridges or overspill, and sanded the new fiberglass top skins on the smaller repairs I’d made earlier. 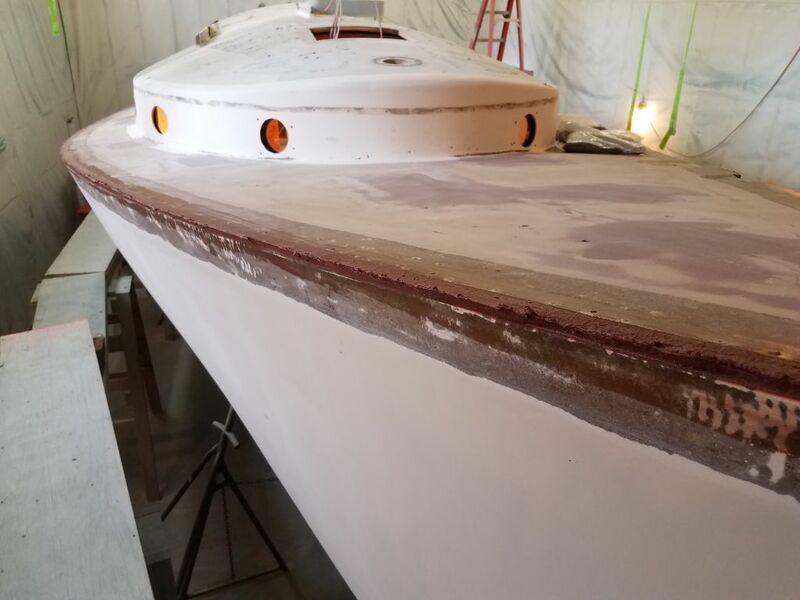 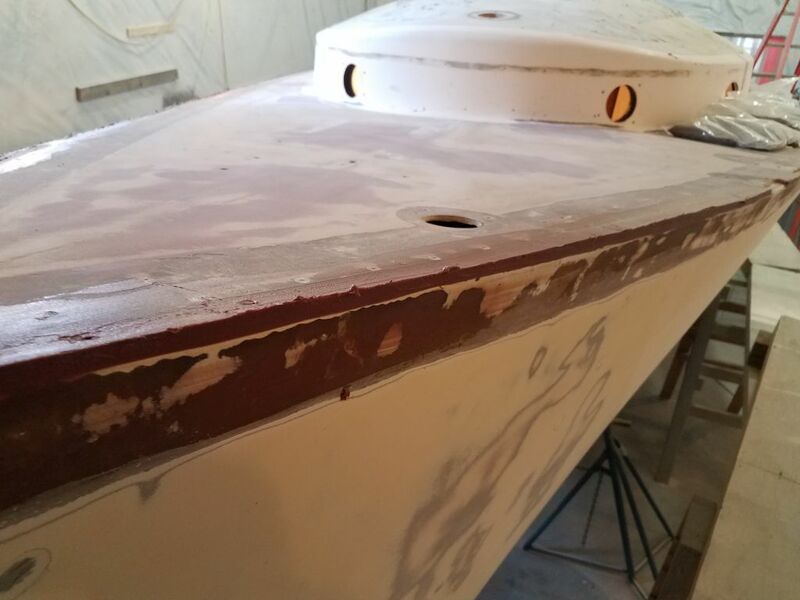 I’d also applied some filler to the small depression in the bottom skin near the forward end of the port sidedeck, and lightly sanded that as well. 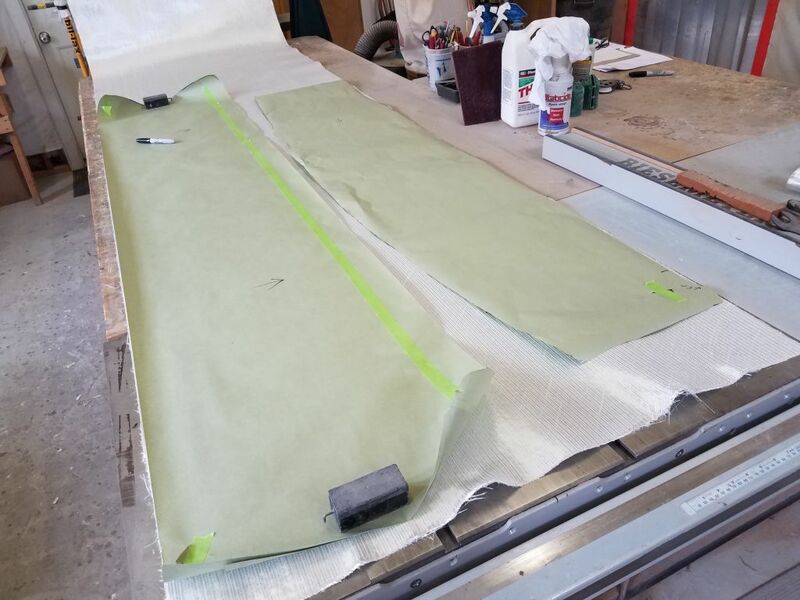 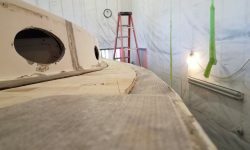 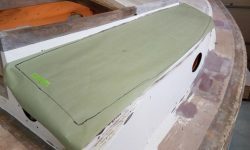 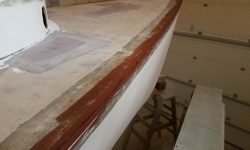 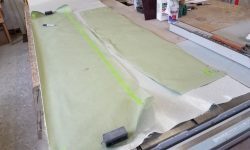 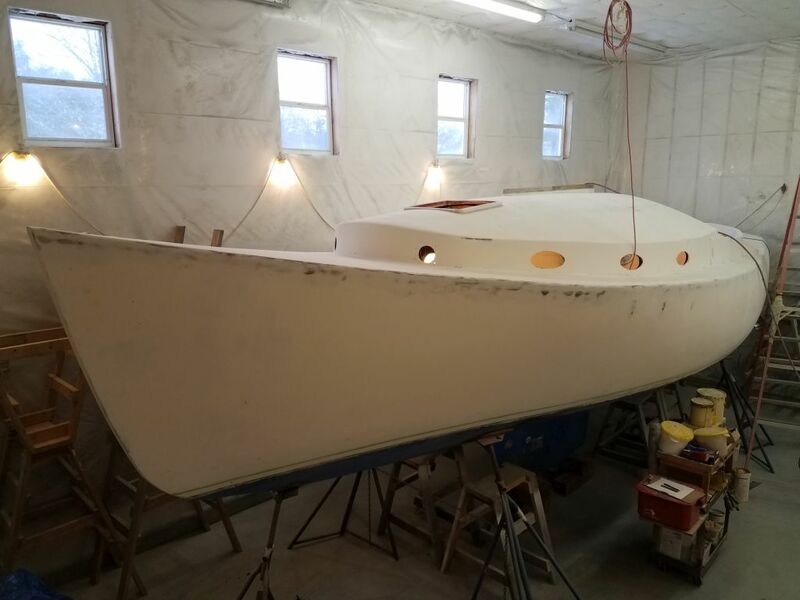 In my usual way, I made paper patterns for the fiberglass needed for the bridgedeck and coachroof, and cut out two layers of 1708 fiberglass for each section. 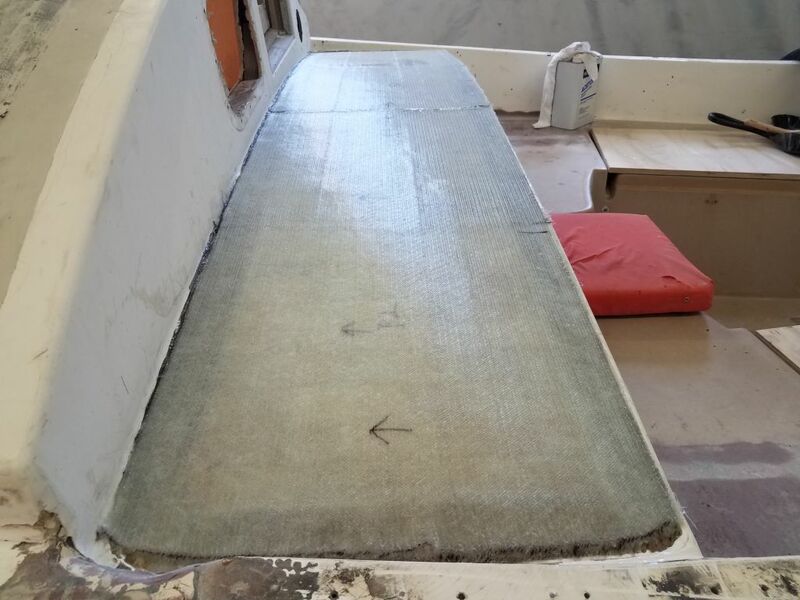 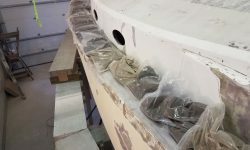 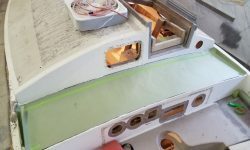 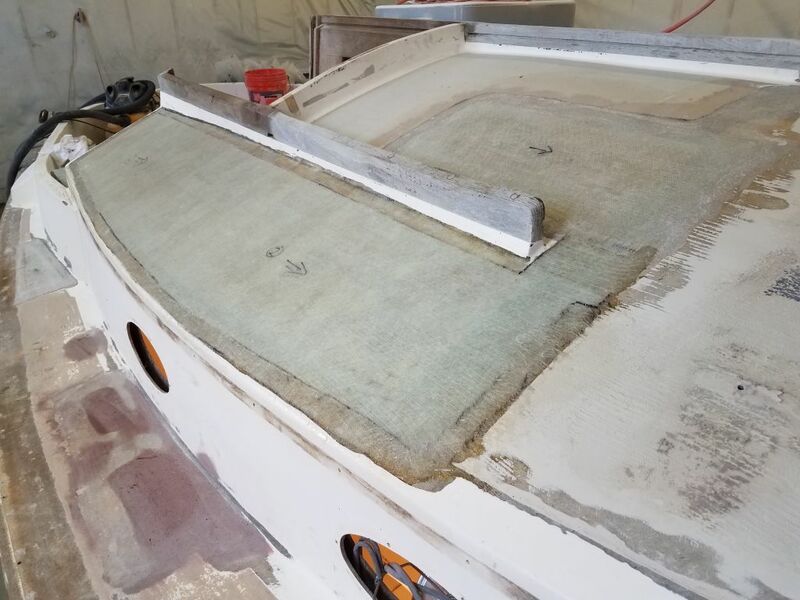 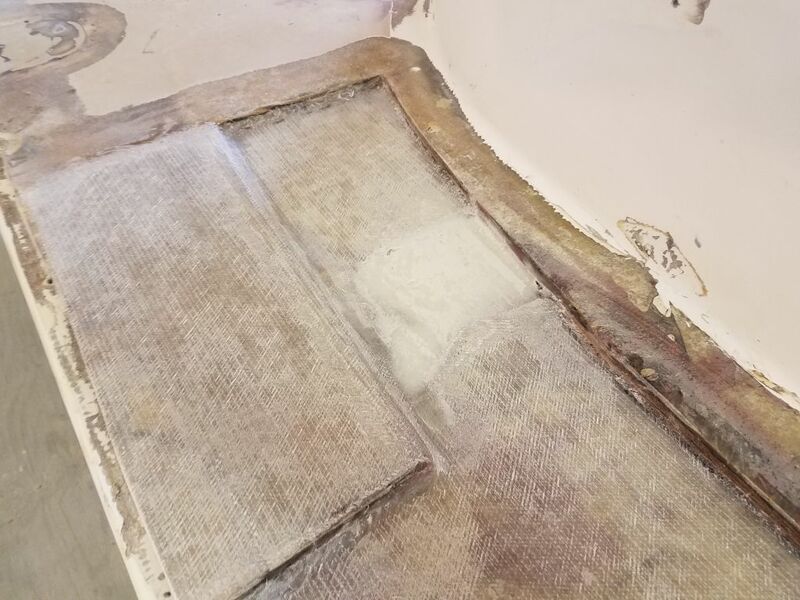 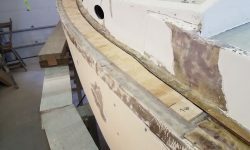 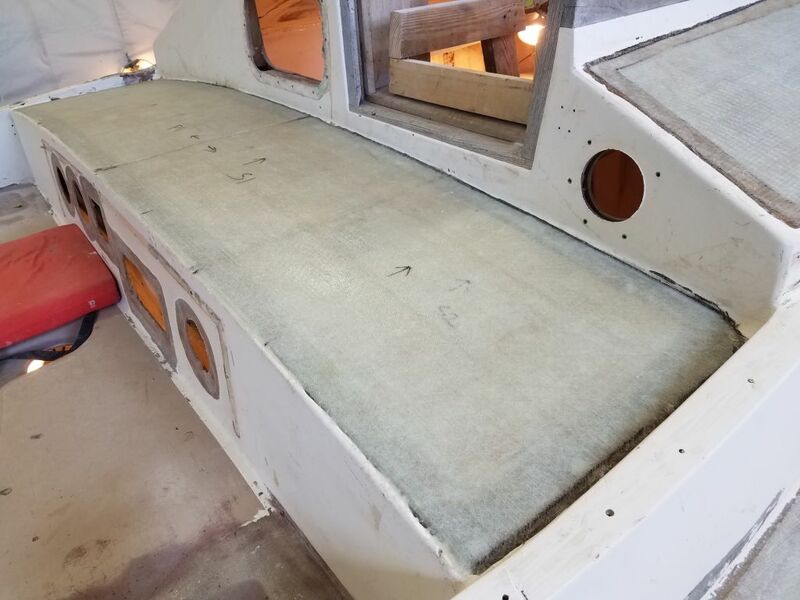 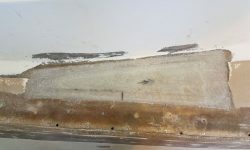 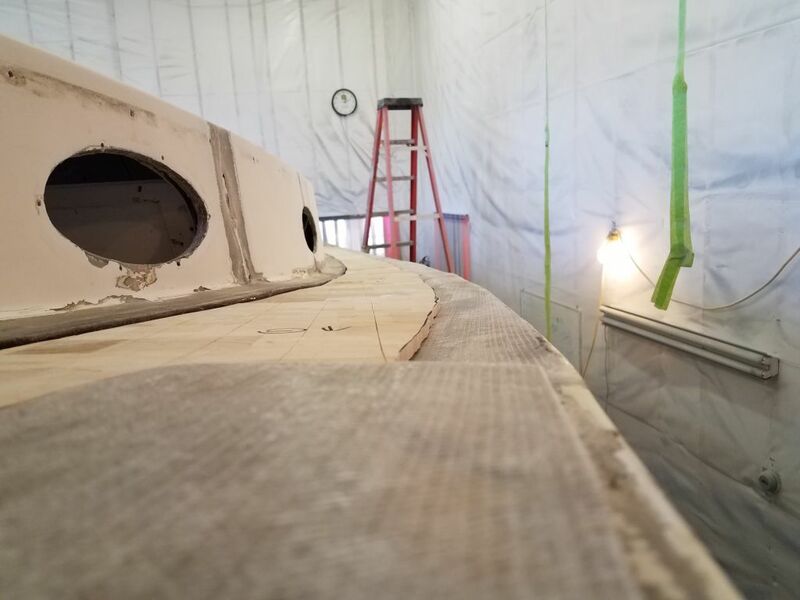 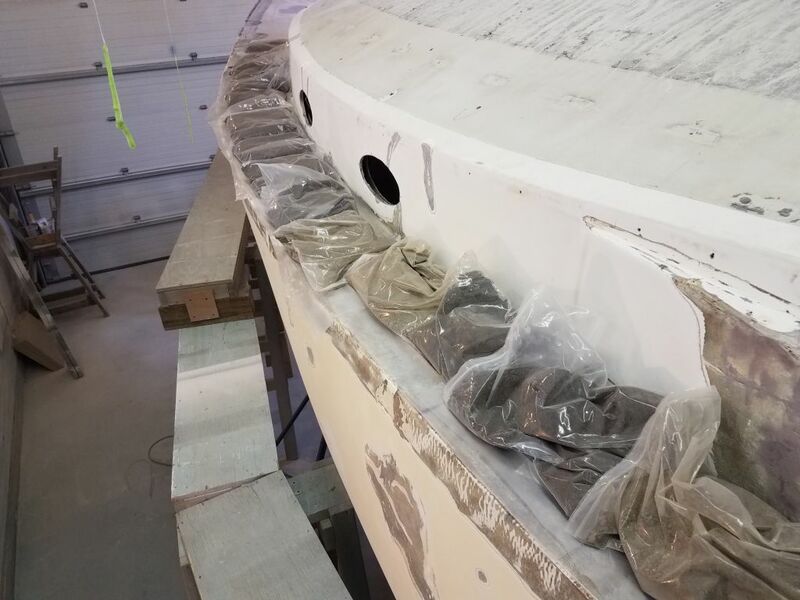 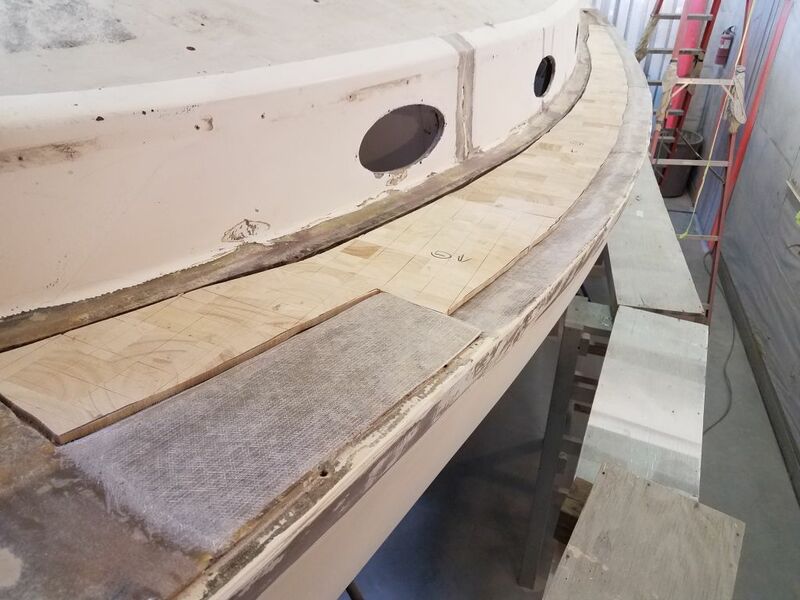 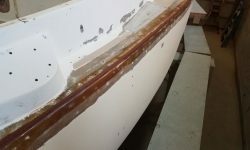 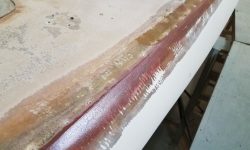 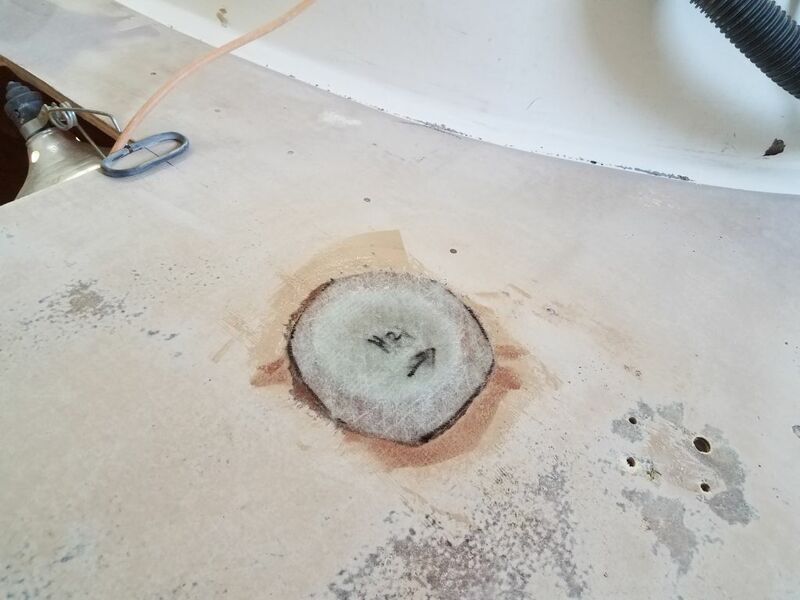 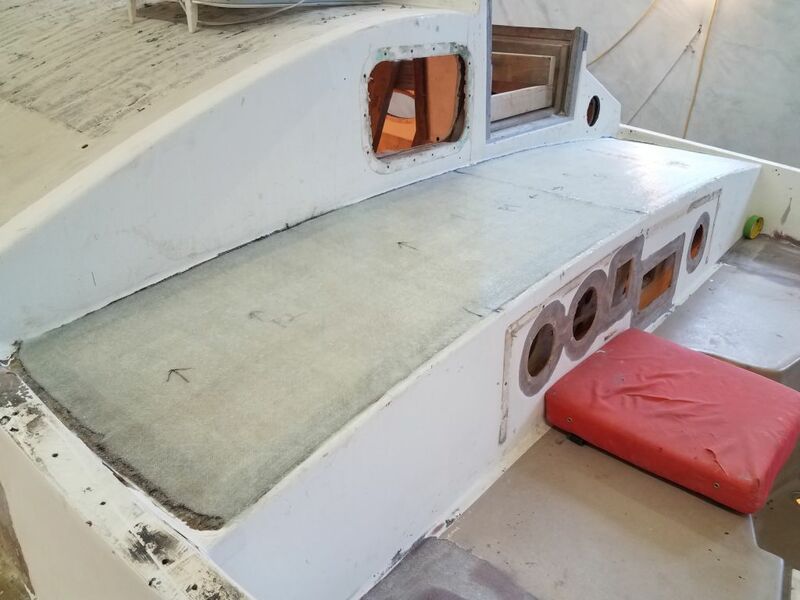 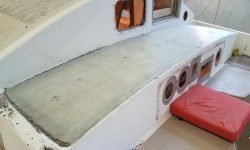 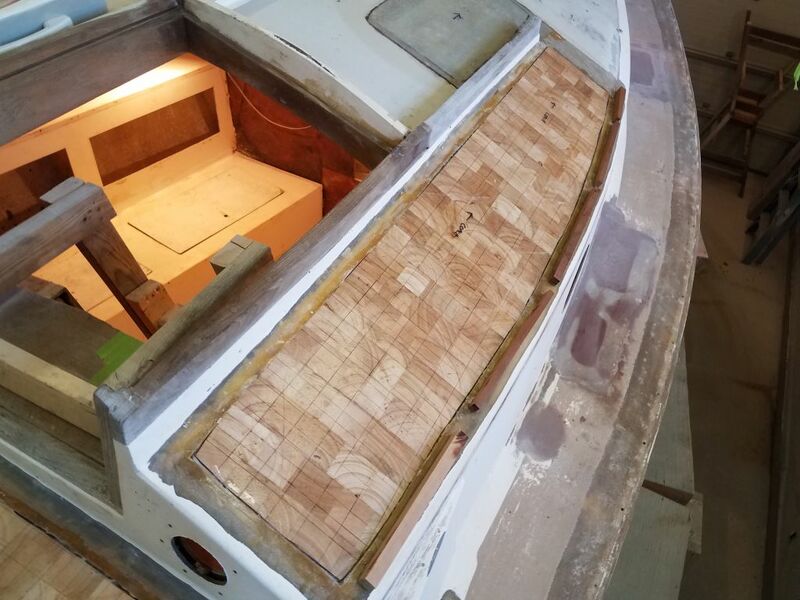 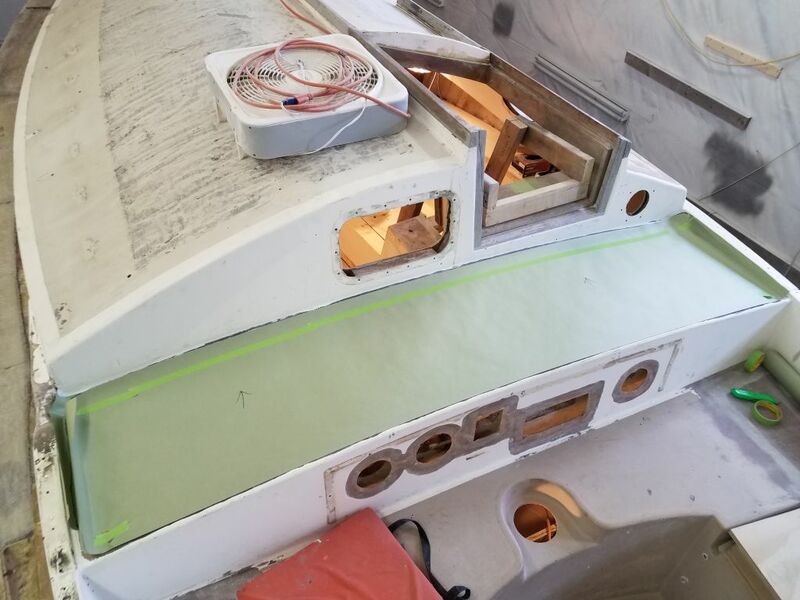 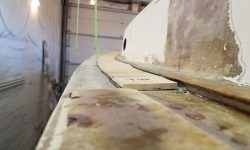 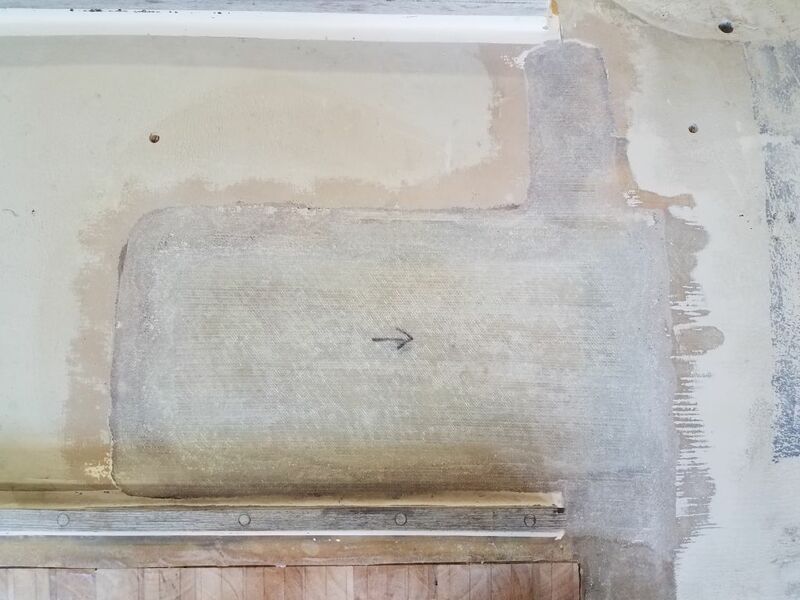 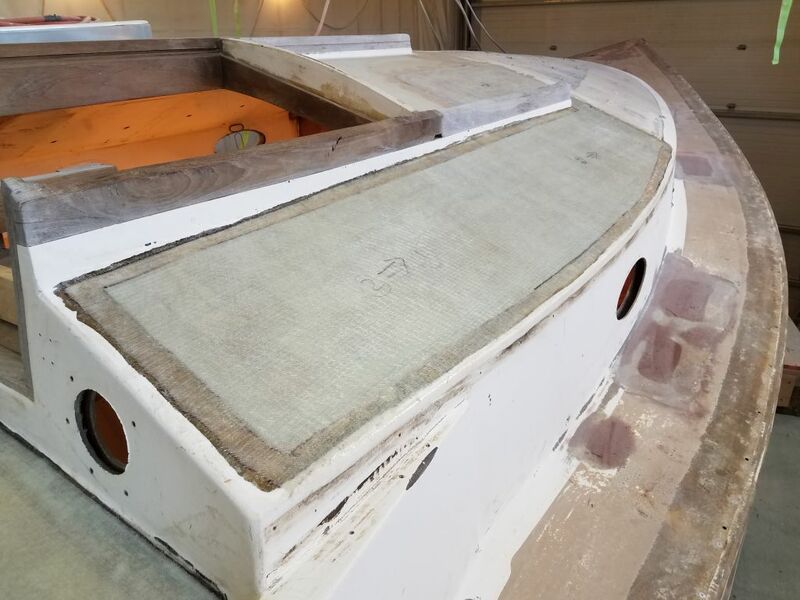 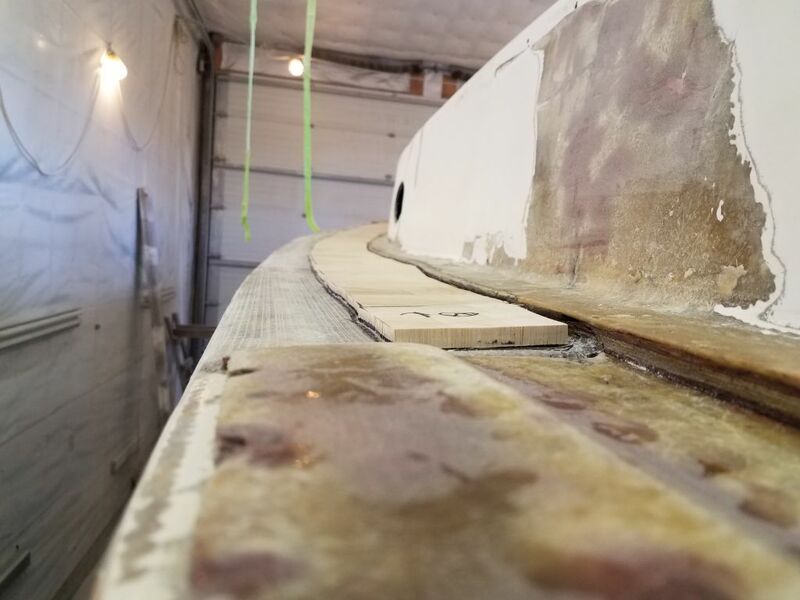 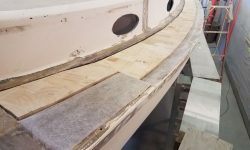 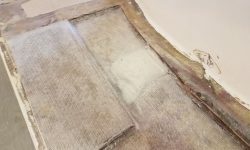 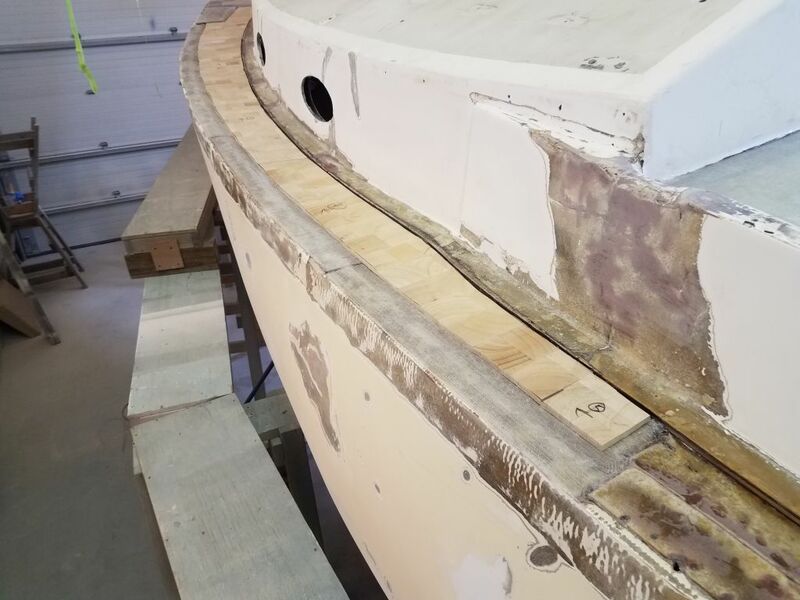 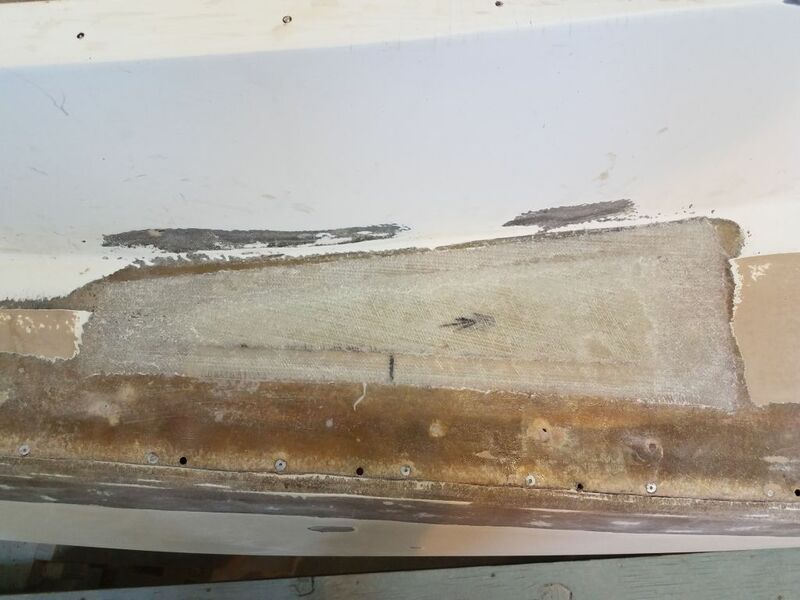 I filled any small gaps remaining around the new core with a thickened epoxy mixture, and after letting that sit while I cut out the new fiberglass, I laminated both areas with the two new layers. 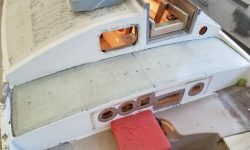 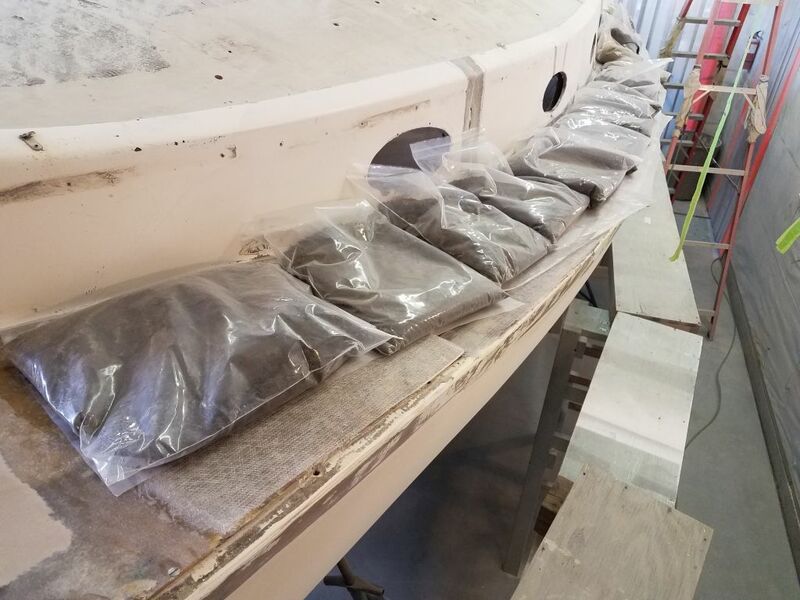 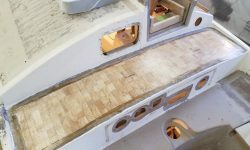 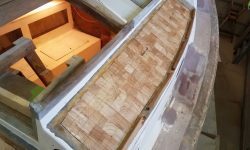 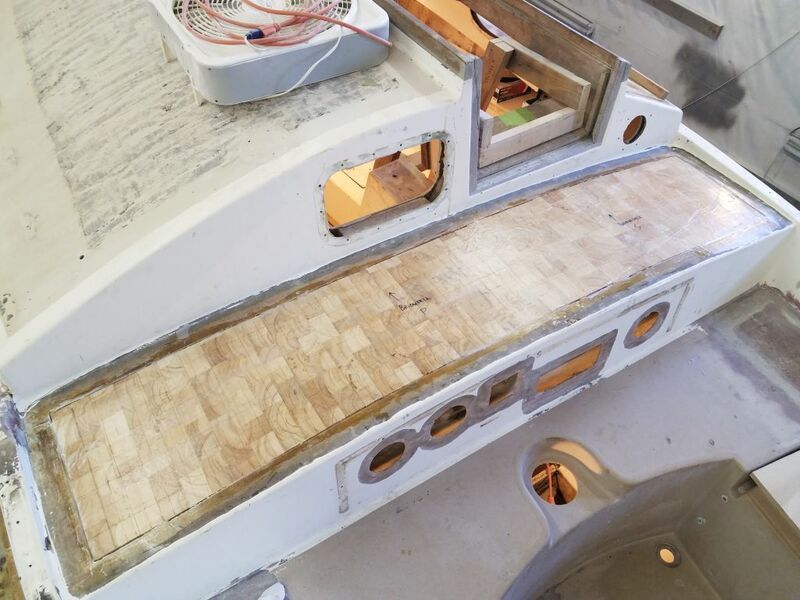 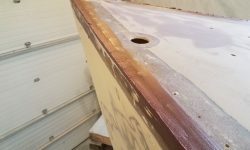 I dry fit the new core pieces on the port sidedeck, made a couple minor adjustments, and then installed the new core in thickened epoxy adhesive, weighing it all down securely. 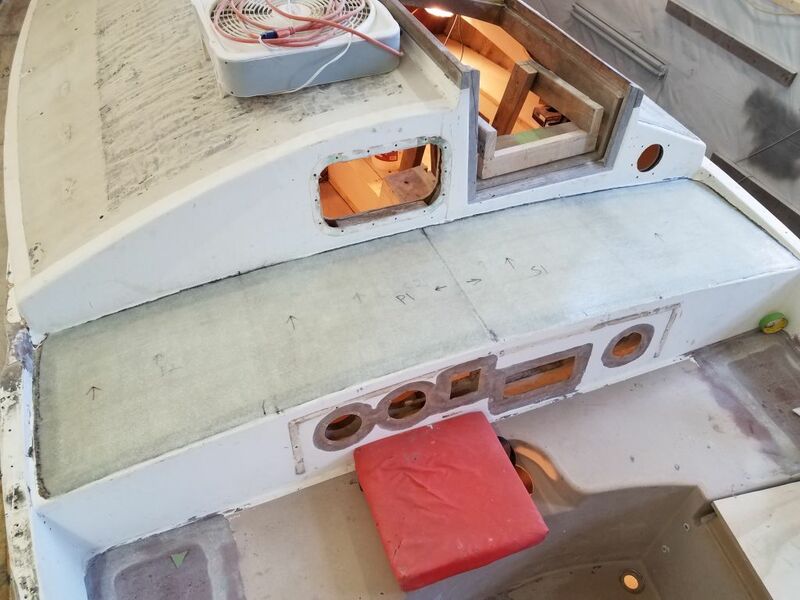 In the cockpit, I filled the large hole left over from the steering pedestal, then installed the two layers of fiberglass over the top of the whole area that I’d prepared earlier. 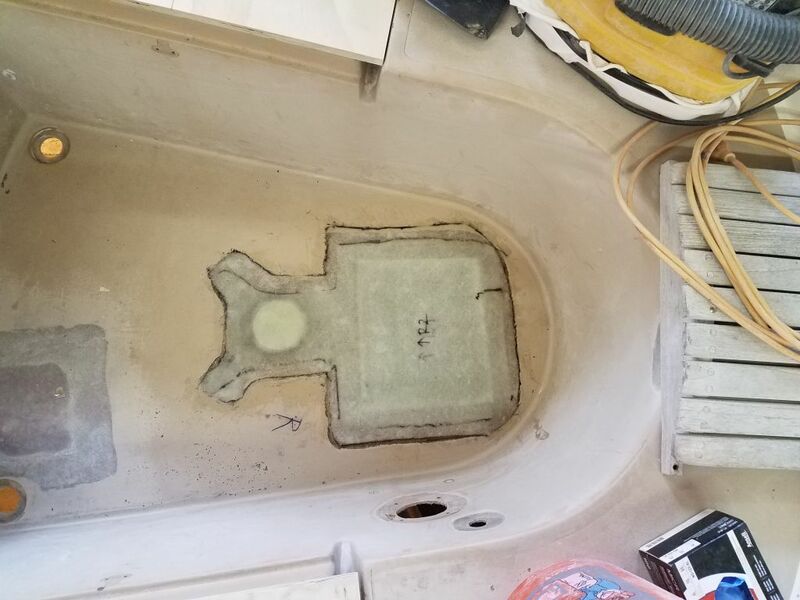 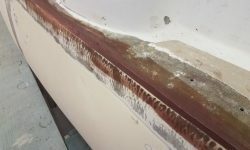 I also filled and patched the old fuel tank fill hole on the poop deck. 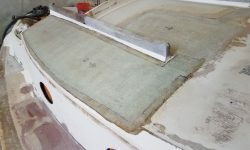 Later, once I’d shifted operations belowdecks, I’d complete these two patches from the underside. 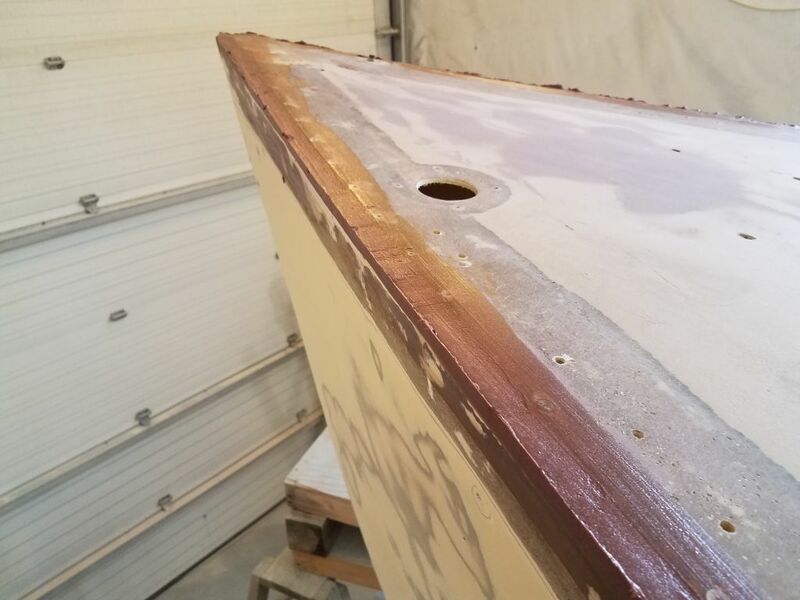 Finally, picking up where I’d left off before, I finished up the initial filling of the hull-deck joint on the starboard side, and applied a second round of filler as needed to some of the previously-filled areas on the port side.